Series creator Bill Lawrence has always toggled between the zany and the emotional, and the eighth season is no exception. 414 min. ABC. Director: Zach Braff. Cast: Zach Braff, John C. McGinley, Donald Faison, Courtney Cox Arquette. Though the show must go on, the eighth season of Scrubs (aired on its new home at ABC) has a certain finality to it. The nineteen episodes culminate in series star Zach Braff's exit as a series regular. Though he will guest star repeatedly in Season Nine as the series shifts its focus from a hospital to a medical school, Braff's exit (and he's not alone) marks a definite turning point. Series creator Bill Lawrence has always toggled between the zany and the emotional, and the eighth season is no exception. Several episodes will no doubt have fans stifling tears, whether of laughter or sadness. Scrubs essays the ups and downs of life and death within the walls of Sacred Heart Hospital. With Dr. Bob Kelso (Ken Jenkins) retired as chief, the vacant spot shakes up operations. First it is temporarily occupied by Dr. Taylor Maddox (Courtney Cox), and then, inevitably, by Dr. Perry Cox (John C. McGinley). Nurse Carla Espinosa (Judy Reyes) and Dr. Christopher Turk (Donald Faison) are expecting a child, hospital lawyer Ted Buckland (Sam Lloyd) and The Janitor (Neil Flynn) have struck up serious new romances, and Dr. Elliot Reid (Sarah Chalke) and Dr. John "J.D." Dorian have rekindled their old one. As if that weren't enough, the old hands have a new class of interns (Aziz Ansari of Parks and Recreation, Eliza Coupe, Sonal Shah, Todd Bosley, and Lee Thompson Young) to whip into shape. Despite the shakeups, Season Eight is mostly business as usual. The viewpoint of the series still belongs to J.D., a character given to flights of fancy that we see in their entirety. One episode, for example, has J.D. imagining what his week would be like if the Muppets invaded Sacred Heart, so guest stars including Kevin "Elmo" Clash participate in some semi-randy skits bringing J.D. 's fantasies to life. When the show isn't getting wacky with the week's running gags, it's dealing with the emotional hardships of being a doctor—especially dealing with medical bad news or mistakes on the job—or the tumultuousness of personal relationships. Though most of the latter are sexual in nature, the series' most enduring romance is between J.D. and Turk: despite the women in their lives, the two are inseparable and committed to each other. The particular reflectiveness of Season Eight includes return appearances from Elizabeth Banks and Scott Foley (who had logged fourteen and eleven previous episodes, respectively). When J.D. realizes that it's time to move on from Sacred Heart, the effects ripple out to everyone on staff, which gives Lawrence plenty of material (how, for example, will The Janitor react to the loss of his arch-nemesis?). The season's stunt episode is a two-parter set in the Bahamas on the occasion of The Janitor's wedding; typically tongue-in-cheek, the outing spoofs sitcom vacation episodes (particularly The Brady Bunch's Hawaiian excursion) even as it is one. The finale is likewise a two-parter, culminating in J.D. 's emotional emotional walkout and including a few more surprise visits. In a ninth season on ABC, life will go on for Scrubs, though it'll never be the same. 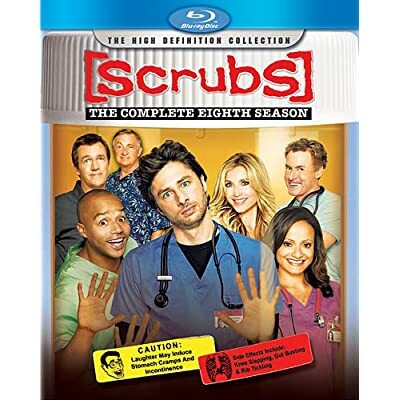 Scrubs makes its Blu-ray debut in a handsome Complete Eighth Season set from Buena Vista. Picture quality is excellent, with solid black level, vibrant color and detail far beyond what sitcom viewers have been programmed to expect. It's a brave new world of 1080p widescreen transfers and DTS-HD Master Audio 5.1 mixes for the sitcom genre, so the picture pops and the sound wraps around for a suitably impressive home-theatrical experience. Music cues come through especially well, and the fantasy sequences have a bit of extra pizazz, though the show is mostly about front-and-center dialogue, delivered cleanly here. Perhaps the coolest feature to this two-disc set is SeasonPlay, which will keep track of where you left off in watching the season of nineteen episodes. Happily for fans, Buena Vista didn't stop there. Disc one includes ten commentaries: "My Jerks" with executive producer Bill Lawrence and writer/producer Kevin Biegel; "My Last Words" with Lawrence and Zach Braff; "My Saving Grace" with Lawrence and Biegel; "My Happy Place" with Lawrence and Robert Maschio; "My ABC's" with Lawrence, producer Randall Winston, and Sonal Shah and Eliza Coupe; "My Cookie Pants" with Lawrence and John C. McGinley; "My New Role" with Lawrence and Ken Jenkins; "My Lawyers in Love" with Lawrence and Neil Flynn; "My Absence" with Lawrence, Winston, Biegel, Shah, and Coupe; and "My Comedy Show" with Lawrence, Shah, and Coupe. Disc two includes six more commentaries for "My Nah Nah Nah" with Lawrence and Sarah Chalke and Donald Faison; "Their Story II" with Lawrence, Winston, and Flynn; "My Full Moon" with Lawrence, Chalke, and Faison; "My Soul On Fire Parts 1 & 2" with Lawrence and Christa Miller; and "My Chief Concern" with Lawrence and Braff. "My Bahamas Vacation" (20:13, HD) documents the show's working vacation to shoot the season's two-part escapade in Abacos. Tons of behind the scenes footage tells the tale, along with series creator Bill Lawrence, Zach Braff, Ken Jenkins, Sarah Chalke, Rob Maschio, Judy Reyes, Donald Faison, John C. McGinley, Christa Miller, producer Randall Winston, location manager Albert Epps, production manager Franklyn Gottbetter, costume designer Carey Bennett, Kit Pongetti, Sam Lloyd, Neil Flynn, makeup department head Phyllis Williams, Bill's parents Van and Susan Lawrence, and Abacos Ministry of Tourism assistant manager Kandy Anderson. 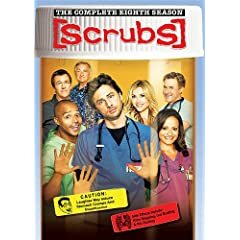 You'll also find fifteen "Deleted Scenes" (11:47, HD), seventeen "Alternate Lines" (14:48, HD), a reel of "Bloopers" (3:12, HD), the Dr. Cox name-calling montage "It's All in the Name" (HD) and eighteen "Scrubs Interns" webisodes (HD). All site content © 2000-2019 Peter Canavese. Page generated at 04/17/2019 04:21:34PM.